If you have ever had a bed bug infestation in your home, you know all too well the value of professional bed bug control. These pesky little insects can be very difficult to completely exterminate without the right tools and extermination methods. Thankfully, Pest Arrest is here to help. We provide Top Rated Local® pest control in Spring, including bed bug extermination, and we are happy to provide you with an industry-leading bed bug inspection to determine whether or not there are live bed bugs in your home. Contact us today to schedule a reliable bed bug dog inspection! In the meaning, let’s take a look at some of the most frequently asked questions about this troublesome pest. Bed bugs are very small pests — adults are approximately ¼ of an inch long and nymphs may only be around 1 millimeter long. Adults are reddish brown in color, and nymphs are almost colorless. Depending on how recently they have fed, bed bugs will either be flat and oval-shaped, or they will be swollen and elongated. It can be hard to identify bed bugs if you don’t know what to look for. Additionally, there are other insects that have a similar appearance to bed bugs. Professional bed bug exterminators have a trained eye (and we have trained bed bug sniffing dogs) to confirm the presence of the bug. They can usually be found in close proximity to where people sleep and lounge since they feed at night. It is always a good idea to contact a professional bed bug control company to perform an inspection, even if you have performed your own. At Pest Arrest, we have a team of trained, certified bed bug dogs. Tracer, Kinsey, and George can determine the exact location of live adult bed bugs and their eggs. As such, they can confirm existing infestations in both residential and commercial properties, and they can be a part of ongoing prevention and inspection. Contact us today to learn more! How Did Bed Bugs Get In My House? This is one of the most common questions that our team receives. Bed bugs are expert hitchhikers, and they are incredibly good at hiding in suitcases, boxes, and clothing. That means that they could come home with you after a vacation or after visiting a relative. Bed bugs have been found in movie theaters and public libraries, and they have even been detected in cars, buses, and trains. 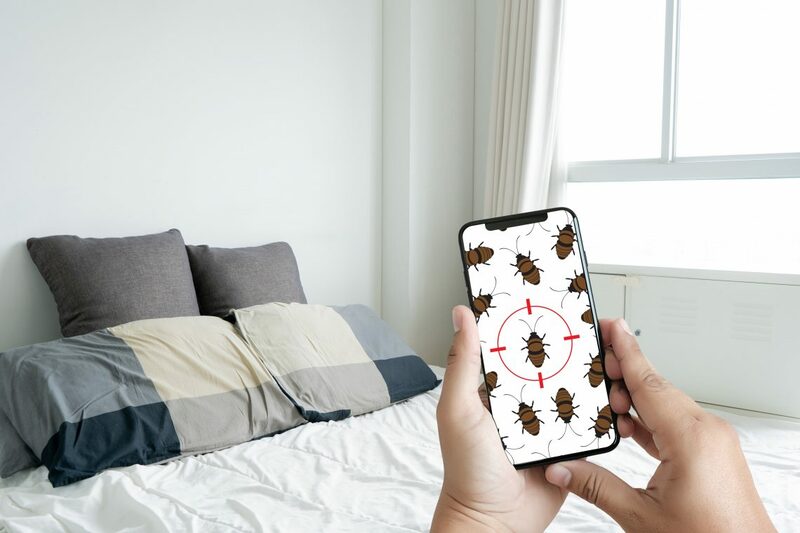 Contrary to popular belief, bed bug infestations are not only limited to properties with unsanitary conditions, although these conditions do make it easier for the infestation to worsen. Can I Get Sick From a Bed Bug Bite? The Texas Department of State Health Services advises that bed bugs should not be considered a medical or public health hazard. They are not known to spread disease, but their bites can cause skin irritation for certain individuals. Itching the bite can lead to a secondary skin infection, which can make you sick. If you are concerned you have been bitten by a bed bug, it’s probably best to contact your doctor. What Is the Best Bed Bug Extermination Method? While there are some pesticides that are effective, many of them are not that eco-friendly. Our team has discovered that thermal heat and steam are the most effective bed bug extermination method, and these techniques don’t rely on residual pesticides. In fact, thermal heat has proven to be 97 percent effective in bed bug control, often exterminating an infestation in as little as one treatment. This is because bed bugs cannot live when temperatures exceed 113 degrees Fahrenheit, and our thermal heat treatments increase temperatures to 130 degrees for three hours. This effectively kills all stages of bed bugs, from eggs to nymphs to adults. Are you worried that you might have a bed bug infestation in your Spring home? Some homeowners put off calling a bed bug extermination company because they feel embarrassed about having bed bugs in their home. Rest assured that bed bug infestations can happen anytime, anywhere, to anyone, and that being plagued with an infestation is nothing to be ashamed of. 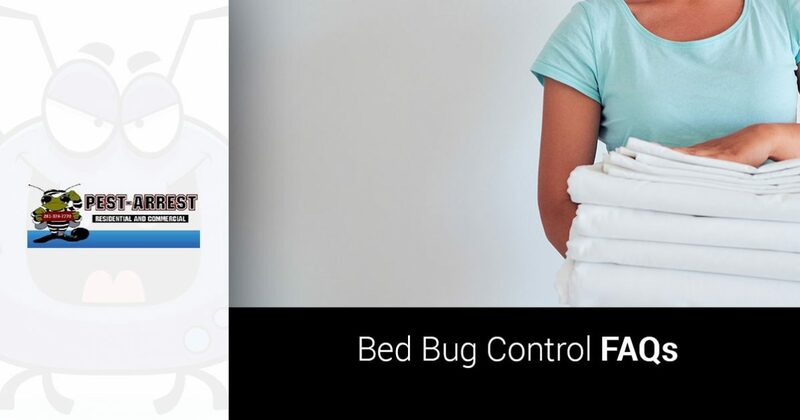 Contact Pest Arrest today to request a bed bug inspection and enjoy the peace of mind and confidence that professional bed bug control provides.